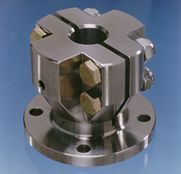 Steel Half Couplings machined from solid to fit Parallel and Taper Shafts for connection between a Flexible Couplings and the Propeller Shaft. Solid Shaft Half Couplings are Pilot Bored and have to be machined to fit the Shaft. Split Half Couplings are Pre-bored to clamp onto Parallel Shafts, standard bore sizes are kept in stock.